We do help everyone who contacts us via our [email protected] email address, but unfortunately most users give bad ratings without ever contacting us for support. Please do contact us if you have any issues, we’re always there to help! Family Tracker allows you to track your wife, husband, children and fiancée. You can now find out where they are, at anytime, as long as they have their phones with them. Family Tracker is available for other platforms as well, so you can track (and be tracked by) other devices as well – check our website for more details. Please note that starting with the new iOS4 and supported hardware, Family Tracker runs in the background at all times, and, unlike previous versions of Family Tracker, user intervention is **NOT** needed for you to track them. 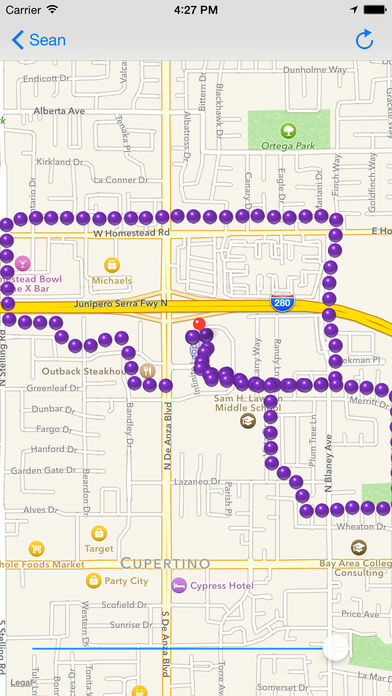 Family Tracker runs at all times, continuously updating the GPS location of the device. Even if the iPhone is rebooted, Family Tracker will automatically resume tracking and updating its position! Simple. 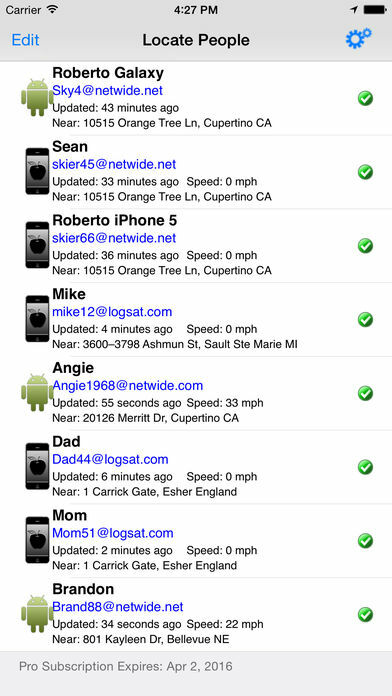 Install Family Tracker on the iPhone/iPad you want to track. From then on, you can use either a web browser or via the Family Tracker app itself installed on your own iPhone/iPad to locate your family member. If the device you wish to track does not support multitasking (for example, older iPhones 3G, iPads), you can still use Family Tracker to locate the family member. Using the web or your own iPhone, you will be able to “ping” the other iPhone. This is done by sending the other iPhone a (free) “Apple Push Notification” which will cause an alert to sound on your family member’s iPhone, even if the phone in is stand-by, just as would happen if the iPhone receives an SMS. 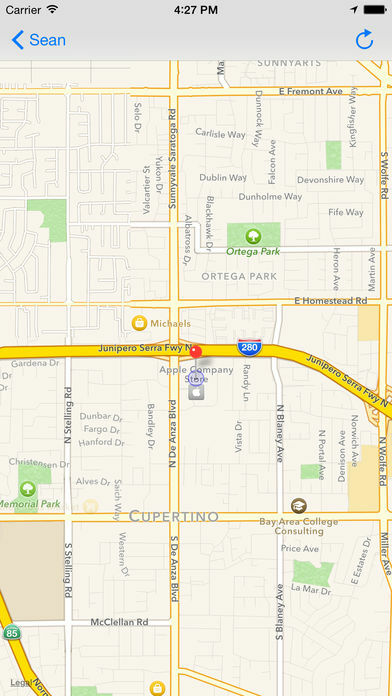 As soon as this alert is acknowledged, their GPS position will be recorded, and their location will be updated on a map. If you are using an iPhone yourself to track them, you will be sent a Push Notification to inform you that the family member has accepted your “ping”. These notifications will be automatically re-sent every 60 seconds until they are acknowledged. If the recipient is trying to ignore them or does not hear them, this repetition will help acknowledging them. Family Tracker does not need to know your iPhone cell number to function, as it does not send SMS messages for notifications. Your email address is instead used to send free Apple Push Notifications to the iPhones being tracked. 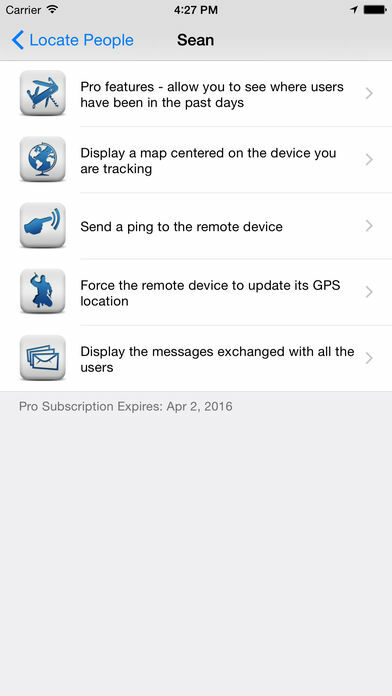 These notifications are free, specific to our Family Tracker application, and work anywhere in the world as long as the iPhone and/or iTouch being tracked has internet access via the cellular network or WiFi. Notice: ***Continued use of GPS running in the background can dramatically decrease battery life. *** For this reason, we strongly recommend users to configure Family Tracker to use the “Driving Only” accuracy in the GPS setting. This special mode updates the GPS location only when a significant location change occurs, which results in a tremendous gain in battery life. 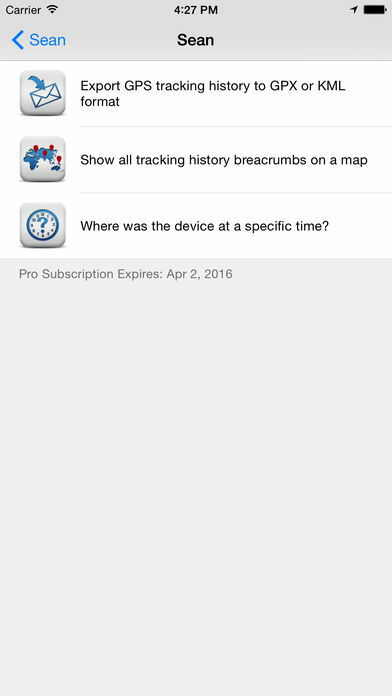 Additional pro features, such as the ability to see the past locations for the previous 2 weeks, and the ability to set geofences so you are alerted when users that you track enter or leave certain areas are available via an optional iTunes subscription.